Astrogeographical resonance degrees of the City of Jerusalem for morphogenetic field level 1 which describes the international and supraregional topics of the City: Jerusalem is located at 2° in dynamical, male fire sign Aries the sign of new starts. action, mobilization, warfare and speed and at 18° in spiritual air sign Aquarius the sign of the sky, heaven, paradise, self-finding, revolution, abstraction and reconnection with the fuller potentials of living beings. In regard to the role of the City of Jerusalem as the holiest place of Jewish as well as Christian religion and one of its birth places the constellation stands for the start of a new era, revolution, rebellion, mutation and the reconnection of religion with its fuller potentials. Along with supercentralistic sign Leo Aquarius can be seen as one of the most important astrological factors in monotheist religions. That can be concluded from the astrogeographical resonance degrees of the egyptian City of Amarna which was used by Pharao Akhenaten in his attempt to establish a monotheist sun religion by abolishing the older egyptian pantheon. See my article: Aquarius and Leo – The Capital of the Sun God Aten. The Church of the Holy Sepulchre also called the Church of the Resurrection is located in the Christian Quarter of the Old City of Jerusalem. For morhogenetic field level 3 it lies in the same morphogenetic field as the Temple Mount wich falls in Pisces with Taurus. 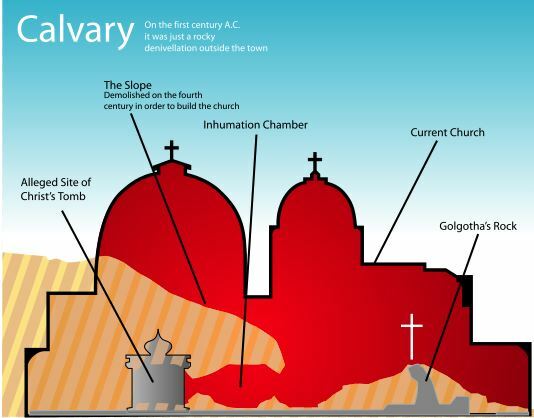 According to traditions dating back to at least the fourth century, it contains the two holiest sites in Christianity: the site where Jesus of Nazareth was crucified at a place known as “Calvary” or “Golgotha” and the empty tomb where he is said to have been buried and from where he resurrected after 3 days. The authenticity of the site as the true Golgotha and tomb of Christ may be improbable. But the site has functioned as a center of pilgrimage and a symbolic site of christian inheritance for as long as 17 hundred years. 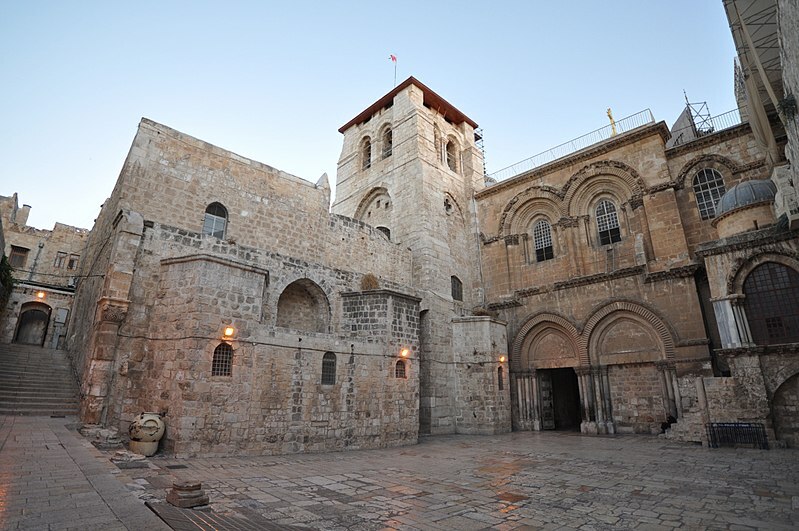 The Church of the Holy Sepulchre is located right next to the Muristan a complex of streets and shops which was the location of the first hospital of the Knights Hospitaller. When rebuilding the City of jerusalem in 130 AD Emperor Hadrian Hadrian built a large temple to the goddess Venus on the site which later became the place of the Church of the Holy Sepulchre. Astrogeographic position of the siteof the Church of the Holy Sepulchre for morphogenetic field level 3 which describes the atmosphere and energetical topics of the churches: the astrogeographical longitude coordinate of the alleged site of Christ`s tomb is located right on the cardinal divide between practical air sign Gemini the sign of road crossings, bridges, sign-posts, symbols, learning, information, language and communication and emotional water sign Cancer the sign of the moon, motherhood, pregnancy, fertility, the uterus, caves, emotional pain and melancholy. The position in Cancer is valid for the supposed site of the tomb as well as for the site of the crucifixion to the east of the Sepulchre Church. With all its potential for melancholy and sadness Cancer so resonates with the topics of pain from the torture, murder and death of Jesus here. The coordinate for the astrological latitude lies right in the very center of earth sign Taurus the sign of the earth, grounding, growing roots, market places, local energetical centers and of profitability. Taurus is the major indicator for the position of ancient town centers and places of the foundation of cities. In regard to the function of the site as an extremely important pilgrimage place Taurus stands for its attractivity and the profits made through the pilgrims. The astrogeographical position in Taurus strongly resonates with the Temple of Venus built here by Emperor Hadrian after 130 AD.